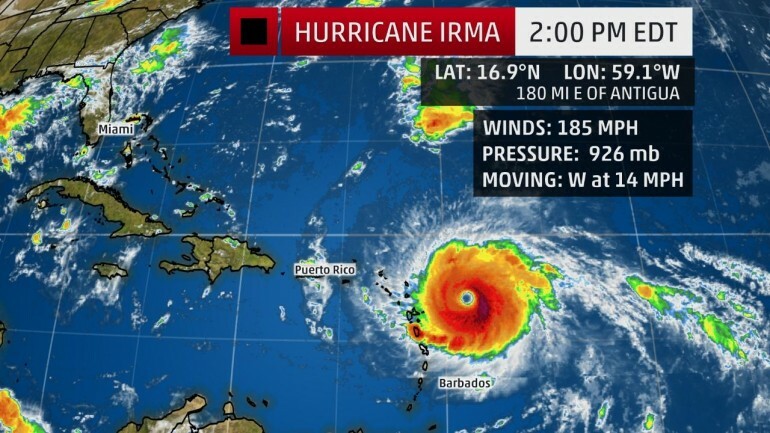 The Weather Channel reports Hurricane Irma, now Category 5, “is an extremely dangerous storm.” Irma's exact track has yet to be determined, but it's expected to make landfall in the U.S. Virgin Islands and Puerto Rico by Wednesday. 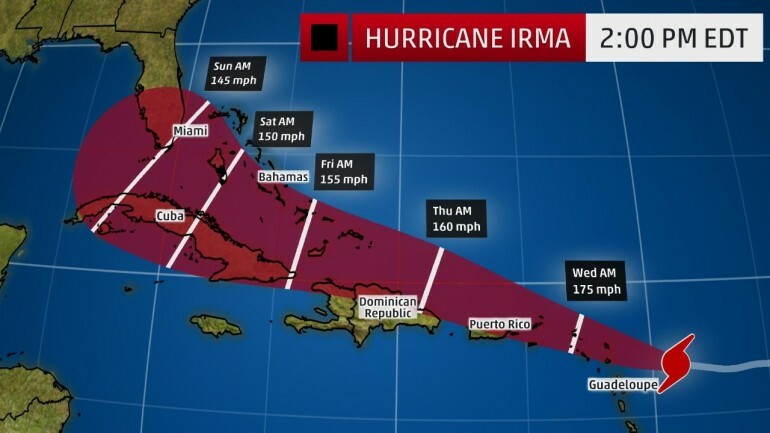 Cuba, Dominican Republic, Haiti, Bahamas, and Turks and Caicos, are also on the storm’s route according to the National Hurricane Center. There’s also a possibility that the force reaches Florida later in the week. Irma became the strongest hurricane in the Atlantic basin, outside of the Caribbean Sea and Gulf of Mexico, on record on Tuesday morning. The destruction is likely to begin in Puerto Rico's north shore where schools were canceled and stocked with supplies to receive residents from low-lying areas. In a statement, Puerto Rico Gov. Ricardo Rossello recommended Puerto Ricans to "take Hurricane Harvey as a lesson" and evacuate unsafely homes. Rossello also declared a state of emergency on Monday, activating the National Guard. Based on wind speed, Irma is the strongest Atlantic hurricane since Wilma in 2005 with maximum sustained winds of 185 mph. Hurricane warnings have been issued for Puerto Rico, Antigua, Barbuda, Anguilla, Montserrat, St. Kitts, Nevis, Saba, St. Eustatius, Sint Maarten, St. Martin, St. Barthelemy, Vieques and Culebra. A hurricane watch is in effect for the north coast of the Dominican Republic to the Haiti border, the Turks and Caicos Islands and the southeastern Bahamas. Additionally, both a hurricane watch and a tropical storm warning have been issued for Guadeloupe, and a tropical storm warning is in effect for Dominica. Leeward Islands: Late September 9 -Wednesday, September 10; tropical storm-force winds will arrive later today. Puerto Rico/Virgin Islands: Wednesday, September 10- early Thursday, September 11. Dominican Republic/Haiti: Thursday, September 11- early Friday, September 12. Turks and Caicos: Late Thursday, September 11 -Friday, September 12. Southeast United States: Beginning in south Florida Saturday, September 13. It’s important to keep in mind emergency situation essentials. "It’s essential that during and after a storm you have the ability to maintain your strength by drinking enough clean water and eating nutrient-dense foods with vitamins and minerals" says Meagan Bradley, VP of Marketing for Nautilus and Excalibur (and a storm-weathering South Florida resident). "The 3 fundamental needs of all human beings are water, food and shelter. If a hurricane, winter storm, earthquake or other natural disaster strikes, dirty water and food shortages may occur for days or even weeks. By taking the time to prepare, you can provide for your entire family," she adds. While unlikely that an emergency would cut off your food supply for weeks, FEMA and The Red Cross recommends maintaining a supply that will last at least two weeks, as in their Food and Water Emergency Brochure. An ample supply of clean water is a top priority in an emergency. A regularly active person needs to drink at least a half gallon of water each day. But, what if stores are out of bottled water? What if you run out of clean water? What if the rivers swell out drinking water supplies leaving only dirty water? Boiling, chlorination and filtering do not remove all contaminants. You will need to turn dirty water into clean drinking water. If you have a water distiller, you’re only a few hours out from turning dirty water into clean drinking water. Water distillation removes microorganisms, heavy metals, salts, and most other chemicals. In emergency situations, Federal Emergency Management Agency recommends having a bag ready with a three day supply of basic food necessities consisting of non-perishable food that is canned or dehydrated. Says Bradley, "Canned food is heavier while dehydrated food is easy and light to transport. There are options for expensive freeze dried meals but we recommend taking charge of your nutrition by making healthy, hearty meals at home before the storm hits." She suggests foods that have a long storage life; require little or no cooking, water, or refrigeration, in case utilities are disrupted; and ones that meet the needs of all family members including pets. Choose foods that are not very salty or spicy, as these foods increase the need for drinking water, which may be in short supply. Flashlights, batteries and other staples are extremely important too. Please visit here for more tips on how to stay safe.